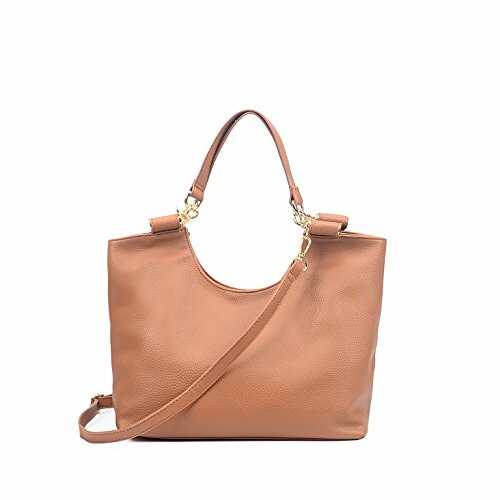 If you were looking for a stylish and practical bag, that carries all your belongings easily yet doesn't look bulky; then look no further as we bring you a versatile FASH Limited Everyday Tote-style Handbag. With stylish dowel covered, rolled sleeve handles that are comfortable to carry. The simple textured design on the leather gives the handbag a sophisticated look in a way like no other. It has a magnetic button closure which makes it easier for you to access all your belongings. It comes with adequate space for you to carry everything you need. Approximate Dimensions: Exterior - 12.09" L X 10.92" W X 5.85" H; Shoulder Strap Drop: 24.96"; Handle Drop: 8.97"
Has a Button Closure, Gold toned Hardware and Handles with Dowels. Has side pockets inside to keep all your small belongings.